Did you know that branded dry mustard has existed for at least two centuries? 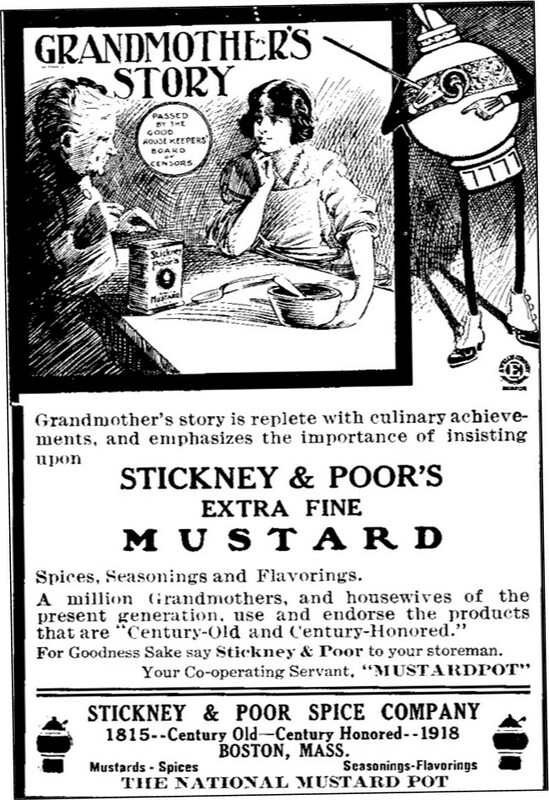 I didn’t until I saw this advertisement for Stickney & Poor’s Mustard in an 1918 issue of American Cookery which said that the brand had already been around for a century. Who would have guessed? I’m befuddled by ad’s graphics and text. What the heck is the thing that looks like a Christmas ornament on ice skates? Dunno. A mustard pot? Fascinating. hmm. . . you may be right. I have no idea what that character is but I think that he’s wearing spats. And I rather like him. Clearly a fellow who lives life by his own code. Now that I look at the figure more carefully I think that you’re right – it’s spats. Whew, that’s a style fad that’s long gone. It’s a fanciful take on their trademark mustard pot. I had to see an enlargement of it on eBay before I could figure it out, but once I saw that, I realized the ice-skating mustard pot was a variation on the mustard pots at the bottom of the ad. When you enlarge the one on eBay, it even has that 1815 date on it. Really cool! I had no idea the company had been around so long. Wow, it still amazes how long commercially packaged mustard and other spices have been around. Thanks for finding. I love your blog! I grew up in New York so I miss all these American things. It’s wonderful to hear that you enjoy this blog. I have a lot of fun doing it. I’m going with a mustard pot with spats. Is the mustard still sold? I love these old advertisements. Mr. Mustardpot reminds me very much of Mr. Peanut who also wore gloves and spats and carried a cane. Both very well-dressed for the times. Thanks for posting this ad. Thanks for reminding me. I’d totally forgotten about Mr. Peanut. – Now I’m going to have look the next time I go to the store to see if he’s still on Planters Peanut jars. Oh my gosh I love old ads! This one is classic. It’s wonderful to hear that you liked this ad. How I want a mustard pot! Great ad. Skating mustard pot! 😂 delightful! Great ad,Sheryl. I’m glad you liked it. Whomever thought up Mr. Mustard Pot must have had a great imagination. I want to look in my supermarket and see if that brand is on the shelf. It’s amazing it has been around so long. Let me know if you find it. When I google the company name, I can come up with some references to Stickney and Poor’s that are relatively recent, but nothing current. Love the graphics of this ad, and curiosity (& detective work) this post has inspired! I am guessing that since mustard is a key ingredient in ancient Ayurvedic medicine, coming from India, the early trade routes must have brought it to the attention of the Brits, who eventually colonized India in the mid-1800s I believe. I guess Stickney & Poor’s was one of the early ones to pounce and market mustard, with an Anglicized bent! This makes sense to me. Your comment make we think of old stories about people using mustard plasters to relieve congestion. I am so fortunate to have wonderful readers who regularly enrich posts with their thoughtful comments and research. I’ve enjoyed getting to know you via our blogs across the years. Enjoy your blogcation! Sometimes it’s just what is needed. I didn’t blog for 6 or 8 months as I transitioned this blog from family history (my grandmother’s diary) to its current format. The break re-energized me, and gave me time to figure out what I wanted to do next. I suppose you’ve heard of the Mustard Museum? https://mustardmuseum.com/. If you are ever in the Madison, WI area, it’s worth a visit. It sounds like a fun place to visit. I knew that there is a Spam museum, but had never heard of the Mustard Museum. There is also a Honey Museum in Wisconsin. There are so many fascinating small museums scattered across the country. It’s a mustard pot! It reminds me of the Planter’s Peanut mascot old-fashioned gentleman wearing a top hat, monocle, white gloves, spats, and a cane. What fun mascots! This bring back warm memories of a Mr. Peanut toy figurine that I had when I was a child.